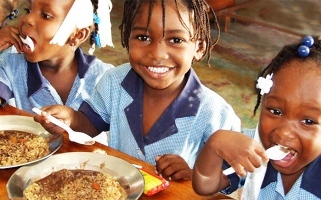 Our congregation has the opportunity to fill 23,760 bags of a rice/veggie/vitamin mixture which will feed 142,500 school children in Haiti and other developing countries through Stop Hunger Now. $35,600 of our Lenten/Easter offering will pay for the ingredients of the bagging event. What a great opportunity to make a difference in lives here and around the world! Sunday shifts are 8:30-9:30, 9:30-10:30, 10:30-12 noon, 12-2, 2-4 and 4-6. 100 people are needed each shift! 10 people are also needed on Fri, Apr 5, 4:30-6 pm and 6-7:30 pm to unload supplies from truck. I'll Help! **Note: Our apologies if you use Internet Explorer 8 and it doesn't work. IE9, Chrome and Firefox do. As of April 3, 13 people are needed from 10:30-12 and 2 people are needed from 2-4. Create an account with our new Meet the Need software to become a "member" of Meet the Need through FUMCR. Then sign up to help with this and future Outreach, Missions and Volunteering opportunities. Meet the Need will send automatic email reminders about your sign ups 21, 7 and 1 day prior to the event. In the event that you will not meet a commitment, please cancel that commitment by logging in to www.meettheneed.org, selecting My Pending Commitments on your Dashboard and selecting Cancel. This will allow others to fill the needed slot(s).